TORONTO MAYOR ROB Ford has withdrawn his bid for re-election to seek treatment for a tumour in his abdomen. Ford’s brother city councillor Doug Ford is to take the the current mayor’s place on the ballot paper. A city hall clerk announced Ford’s decision today, two days after he was hospitalised. It ends a campaign that he had pursued despite persistent calls for him to quit amid various drug and alcohol scandals. Biopsy results on the tumour won’t be back for a week and a definitive diagnosis is pending. The election is scheduled for 27 October and there also two other major candidates are still in the running as well as Doug Ford. Rob Ford’s nephew also withdrew his nomination for a council seat, raising the possibility that the mayor could run for a council seat instead. Ford became an international celebrity last year after acknowledging using crack cocaine in a “drunken stupor” following months of denials. After reports of a second video emerged of him smoking crack, he decided to enter rehab this year and suspend his mayoral campaign, but he steadfastly refused to quit his job or abandon his re-election bid. He returned to work and campaigning in June after two months in rehab. Although campaigning has been underway for months, the official deadline for candidates to sign up or withdraw from mayor’s race was Friday afternoon. 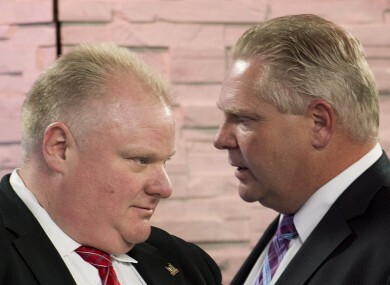 Email “Rob Ford withdraws from mayoral race with tumour, his brother takes over”. Feedback on “Rob Ford withdraws from mayoral race with tumour, his brother takes over”.